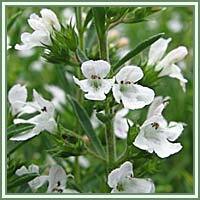 Habitat: Winter Savory is native to warm temperate regions of southern Europe. The plant prefers full sun and well-drained, light soil. Description: Winter Savory is a semi-woody, perennial subshrub growing up to 50 cm tall. The leaves are opposite, oval-lanceolate and have smooth edges. Fresh leaves have a strong and spicy flavor. During summer, spikes of small, white to purplish flowers appear on top. Useful components: Essential oil, tannins, flavonoids, triterpenes. Medicinal use: Winter savory is most often used as a culinary herb, but it also has some significant medicinal uses. The whole plant is antiseptic, antimicrobial, aromatic, carminative, digestive, expectorant and stomachic. Used internally, Winter Savory is an excellent remedy for different types of gastro-intestinal problems. It can be used in treatment of colic, flatulence, gastro-enteritis, dyspepsia, nausea and diarrhea. It is also considered helpful in cases of bronchial congestion, sore throat and menstrual disorders and cramps. 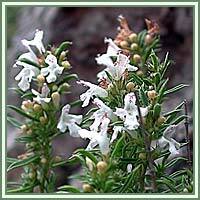 The aqueous extract of Winter Savory has documented strong anti-HIV-1 activity. Used externally, when rubbed onto bee or wasp stings, it can bring instant relief.